CBS has ordered a run of episodes for comedy TV series Fam; starring Nina Dobrev and Tone Bell portraying the characters Clem and Jay respectively; who also share screen-time in drama film Dog Days. Fam is described as a dysfunctional family comedy in which a woman fed up with her father decides to move in with her half-sister and her fiancé. Fam’s cast also features Odessa Adlon (Nashville) as Shannon, Brian Stokes Mitchell (Mr. Robot) as Walt, Brendan Calton (Bosch) as Evan, Sheryl Lee Ralph (Instant Mom) as Rose and Charles Maceo (Grey’s Anatomy) as Officer Lopez. Fam is written by Corinne Kingsbury whose writing credits include Back in the Game and The Newsroom with Aaron Kaplan executive producing having produced TV series through multiple seasons such as Life in Pieces, The Mysteries of Laura and Instant Mom. Meanwhile, it remains to be seen if there will be one continuous director or multiple directors, although the pilot was directed by experienced director Scott Ellis having previously directed some episodes of comedies such as Frasier, 30 Rock, Modern Family, Weeds and 2 Broke Girls. Nina celebrated the news with a tip of a Fam hat. 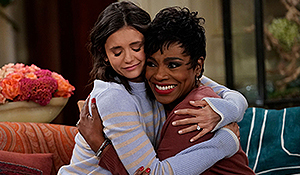 CBS picking up Fam for a series order showcases what an amazingly successful year Nina and all of her fans are enjoying with Dog Days, Departures, Run This Town, Lucky Day and the rumoured appearance in All-Star Weekend, alongside the pre-production of The Return of Xander Cage sequel that Nina is also expected to star in. Looks like Nina Dobrev might be returning to our Prime time Lineup in the new CBS Pilot “Fam” where Nina will play the lead. How exciting is this news? We here at NDN want to wish Nina the best on this Pilot and we will be rooting as always for her. Written by Kingsbury and directed by Scott Ellis, Fam is about a woman, Clem (Dobrev) whose younger half-sister, Shannon (Odessa Adlon), comes to live with her and her fiancé to escape their train wreck of a father. Dobrev’s Clem is grounded, deeply funny, quick-witted and outspoken. She was a bit of a hot mess in her younger years, but since then, she has worked hard to create the best version of herself and her life is on track. She is a real charmer who is ecstatic when Jay, the love of her life, proposes. In the “best version of herself,” she claims that her own father is long dead, but the fact is that her dad, Freddy Banks, whom she hasn’t seen in 10 years, is such an embarrassment that she has lied about his death. And when her half-sister Shannon shows up unexpectedly, Clem’s lie is about to become painfully obvious to everyone who trusted and believed her. And that lie just might end her relationship with Jay for good.